My parents have been working so much these days – it’s crazy! They must be working at least 70+ hours a week. My brother and I thought it’d be nice to make a nice fancy dinner at home since they are too tired to go eat out when they get home. 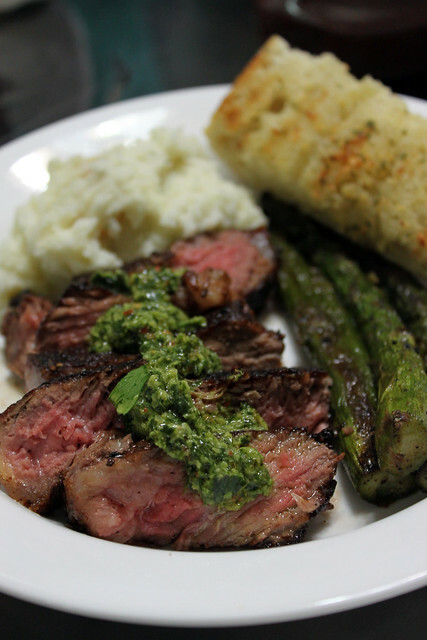 After brainstorming we decided to go with NY Steak with Chimichurri Sauce and Grilled Salmon for the main course and grilled pineapples, grilled asparagus, home-made garlic bread, and garlic mashed potatoes for sides. Fancy huh? For this blog, I will just focus on the NY Steak since I thought it was definitely the star of the night. Instead of grilling the steaks, I went with a pan-searing method over the stove top. I like the caramelized crust that forms when the steaks are seared. 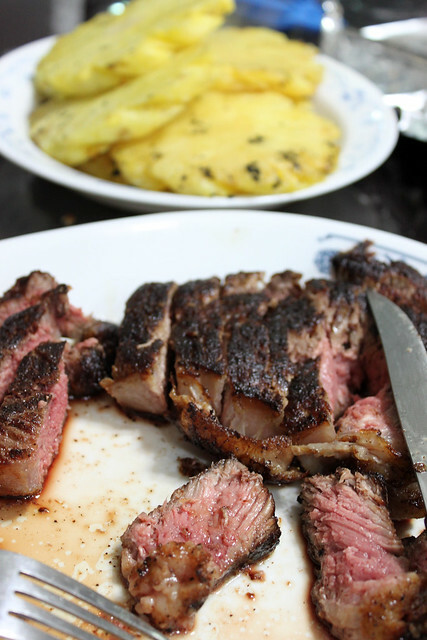 It gives the steak a nice crisp bite on the outside while still ridiculously tender and juicy on the inside. 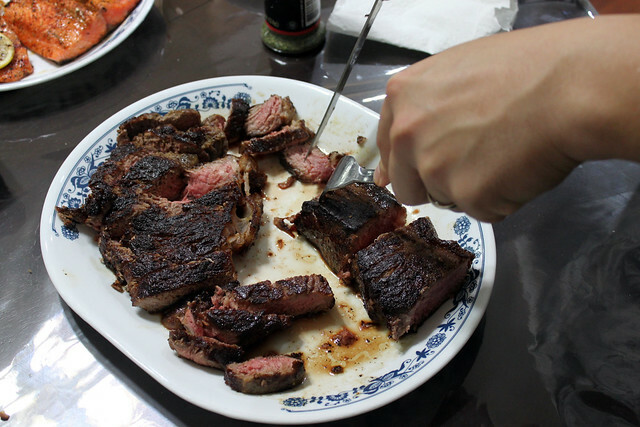 When pan-searing, you will notice that it gets a little smokey, but don’t worry, the steaks aren’t burning! For the steak topping, I went with a fresh Chimichurri sauce. It added a nice tart kick to the steak. To make the Chimichurri sauce, I just combined everything in my Magic Bullet and let it blend for a few seconds until everything is nicely chopped. Make sure you have some gum or mints available after dinner since there are tons of garlic in the sauce and your breath will be super garlicky! Pat dry steaks. Season liberally with salt and pepper. 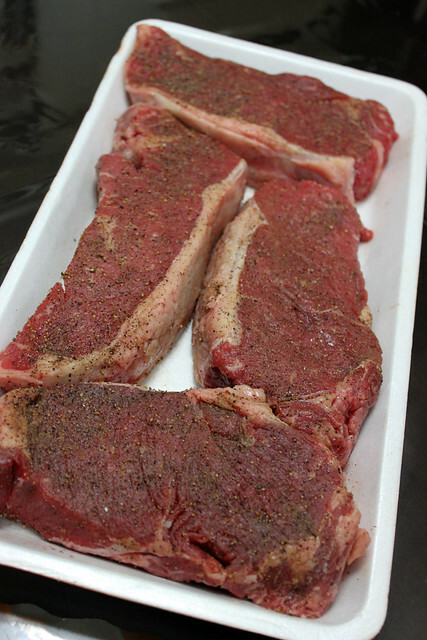 Let steaks reach room temperature before cooking. In a blender or food processor, combine the parsley, garlic, Mexican oregano, olive oil, rice wine vinegar, lime juice, salt, ground black pepper, and sugar. Mix well, but do not puree. Set aside. Allow steaks to cool for at least 5 minutes. Slice steaks and place on a serving platter. 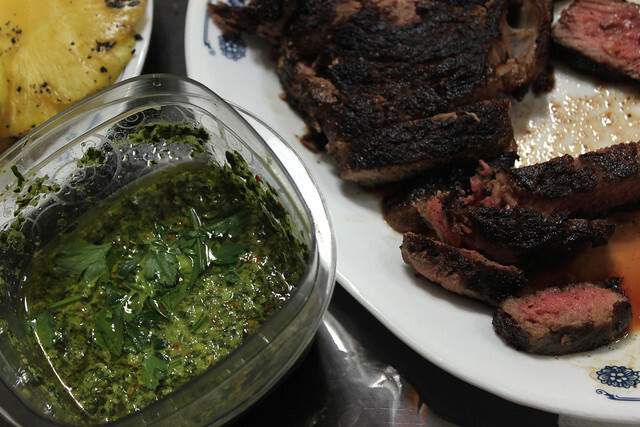 Top steaks with Chimichurri sauce and serve!